Egypt And Israel: A New Economic Future On The Horizon? February 28, 2011  The recent revolution in Egypt has led the Middle East to a political tipping point. Will this lead to shifts in the economic realm as well? This is a seizable moment, and the seizing needs to be done by Egypt and Israel together. February 18, 2011  The U.S. has vetoed a U.N. Security Council resolution branding Israel's West Bank settlements "illegal." February 16, 2011  Israel's foreign minister says the move is a provocation by Iran. The U.S. State Department it has no information what kinds of ships are in the Red Sea or where they're headed. February 16, 2011  The Obama administration's job of promoting Arab-Israeli peace may have just gotten harder. 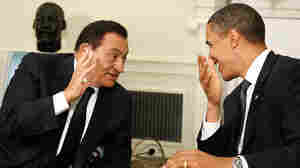 The U.S. lost a key player when former Egyptian President Hosni Mubarak was forced out of office. And Palestinians are still reeling from leaked documents that put everyone in a bad light. February 16, 2011  Palestinian leaders are acutely aware the earthquake that's rumbling across the Middle East could soon arrive on their soil. The Palestinian Authority in the Israeli-occupied West Bank is trying to ease the pressure by promising general elections later this year. The prime minister has dismissed the Cabinet and will appoint a new one. Will this be enough? February 15, 2011  The U.S. has long supported authoritarian leaders in the region in order to ensure stability, but the manner of the Egyptian president's ouster suggests that such regimes may not be stable in the long term. The U.S. may also have to take Arab public opinion more seriously. February 14, 2011  Egyptians are waking up to a new political future, this week — one without President Hosni Mubarak. The parliament has been dissolved and the military's Supreme Council has set a timetable for a transition to a new government. To discuss the road ahead for Egypt and the region, host Michel Martin speaks with Jordan's former Deputy Prime Minister, Marwan Muasher, who is now Vice President of Middle East studies at the Carnegie Endowment for International Peace. February 13, 2011  In Gaza, there were cheers over Hosni Mubarak's fall in neighboring Egypt. In Israel, the mood was something more wary. Officially, Israeli authorities and Prime Minister Benjamin Netanyahu expressed satisfaction that Egypt's new military rulers said they would stand by regional and international treaties. February 13, 2011  Once the immediate euphoria over the resignation of Egyptian President Hosni Mubarak has passed, some challenging questions about the future there will have to be addressed. The popular revolution was a call for change, but there are still too many uncertainties to know what shape that change will take. February 10, 2011  Egyptians calling for the resignation of President Hosni Mubarak continued to flood Cairo's Tahrir Square Thursday. Guests provide an update from the crowded square, and discuss what a possible Mubarak resignation could mean for Egypt and its neighbors. February 10, 2011  Protests in Egypt seem to have reached a critical point, with President Hosni Mubarak set to address the country tonight. Kai Bird of Foreign Policy argues that the uprising in Egypt will force the U.S. and Israel to create peace in the Middle East, or else find themselves increasingly vulnerable. February 10, 2011  The widespread protests — and their threat to the stability of Egypt — have caused enormous concern in Israel. But so, too, has the White House's handling of the crisis. 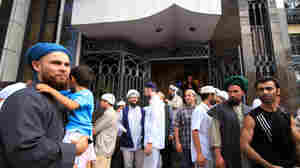 In Egyptian Uprising, A Tale Of Two Risks For U.S.
February 9, 2011  U.S. policymakers face a dilemma: The democratic process in Egypt, if allowed to run its course, could bring to power a new government unsupportive of U.S. priorities. But if the democratic process is blocked, the outcome could be equally damaging to U.S. interests. February 8, 2011  NPR ran a story about a Palestinian village nearly surrounded by Israeli settlements that claimed Israeli mistreatment. But didn't get Israel's side of the story.